Thankfully the transition from Summer to Winter was kind to us equestrians, the dry weather meant Oscar continued to live out until late November as I firmly resisted the temptation to stable him overnight in a smart stable rug on a fluffy bed, this was because of Oscar's recent diagnosis of arthritis - high ringbone, back in September. The veterinary treatment to reduce the inflammation has been a great success and I am learning all the time about ways to continually manage the condition to ensure a long, happy and comfortable life for my best friend. ...which of course, it did. The Back on Track Royal Quick Wraps increase circulation in the legs, this can reduce swelling, inflammations and speed up the healing process of injuries, they work using the same heat radiation principles of all therapeutic Back on Track products. The above factors are important for Oscar because joint inflammation is the bodies way of fixing a problem, however in the case of arthritis, inflammation can be destructive and the cause of pain. 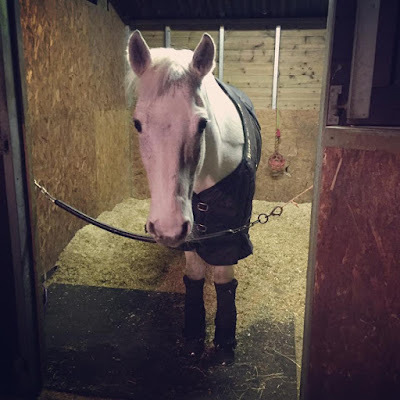 Exercise and movement are key, however so is managing grazing and precious turnout land therefore for us, 24/7 pasture isn't possible during the Winter months and the fabulous Royal Quick Wraps have helped keep Oscar comfortable when stabled overnight. The Royal Quick Wraps are made of two layers velcro'd together, this makes them super hygienic as the inner ceramic infused layer can be easily washed and dried when dirty, this is important because it is in direct contact with the skin, I wrap this around Oscar's lower leg and firmly velcro the second outer layer closed, the second layer is made of a durable neoprene fabric. The wraps are available in four heights, 35, 40, 45 and 50cm, Oscar at 15hh comfortably wears the 40cm size. Overnight they stay in place and take less than a minute to whip off in a morning, once removed his legs are warm and comfortable, never hot and he soundly strides out of his stable, without any stiffness. I believe in the Royal Quick Wraps so much I would love a pair for his hind legs for prevention purposes rather than a cure, another worthy investment from Back on Track.